I could write an entire bog about how we picked our subjects (and may have already), but the simple answer is that I sent out an email to everyone I knew asking them if they knew or knew of people – individuals – on all 6 continents – who were making a positive difference in the world. The response was overwhelming and I still have folders of subject ideas that I would love to do short stories about if I can find the funding and the time. My daughter and I waited until we got back from our round-the-world trip to decide on our North American subject(s) and ended up shooting that segment 4 months later. Surely we were in a different frame of mind and it shows in the piece – it’s a big edgier and less optimistic, but then again it is a story about two women, Maureen Taylor and Marian Kramer, working against all odds in the inner city ravages of Detroit. They are volunteers and street activists – the “voice” for the poor and disadvantaged of their community. Many times when I’ve screened the film, folks want to know why I chose that story to be in the film and some tell me I should take it out – but I won’t. We have edited this segment when we cut the film from 76 minutes to 61 minutes. In the process, we “toned it down”, but I didn’t do that to appease the crowd, I did it because our subjects were good and caring women who were passionate about their cause and I wanted the audience to like them. I also wanted the audience to listen to what they were saying, rather than get defensive and tune them out. 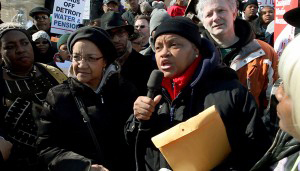 Ultimately the Detroit segment has what every good story needs – conflict. But it also has hope for a better future. This segment is different from the other stories in the film, in that it’s not about giving children and teens a home, or rescuing food or saving the environment, but it is about something that is equally important and that is giving the people a “voice”. Without that, there is no hope for hundreds of thousands of disadvantaged people in America. Being able to have our voice heard is perhaps the most important privilege we have as citizens of this country or any country for that matter. If our “voice” gets silenced, or restricted, the rest of our freedoms will be in danger. Maureen and Marian understand the importance of using their voice. I do as well, and that’s why that story “stays in the film”. This entry was posted in People Making a Difference, Philanthropy, Video and tagged America, demonstration, Detroit, freedom, having a voice, Marian Kramer, Maureen Taylor, poor, protest. Bookmark the permalink. ← Perfectionism – Are You Protecting Yourself from Success?